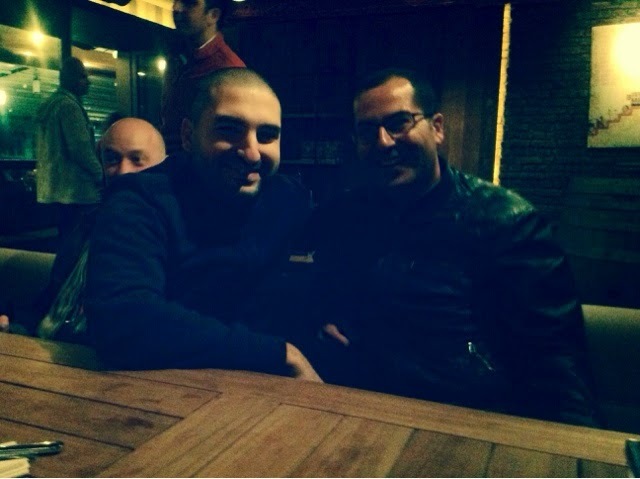 We talked with Ibrahim Maalouf just before his Ankara concert on October 24th. F.E: First of all, welcome to Ankara, it is good to see you once again after the concert you gave here more than a year ago. You have released a new album meanwhile in 2013. What is new and different for you in Illusions compared to the previous ones? I.M: Yeah, two shots maximum. And it was really new for me because it was really the first time I do such an album. I knew the band because we've been playing together for many years but that was the first time we recorded something, which is completely different. There was also something very new. It's that I added to the band three trumpet players. Three of them... I taught them how to play the quarter tones and the maqamat. They are not Arabic, they don't come from the East World, they come from the West World so it was really a challenge to teach them those things. Those are basically the two really important differences. F.E: In my opinion, European Jazz listeners are getting more and more interested in jazz influenced by eastern or -let me say oriental- cultures and nowadays you are one of the prominent names in this genre with Dhafer Youssef and Tigran Hamasyan I think. As far as I can remember, in North Sea Jazz Festival 2013, the doors of Hudson were closed during your concert since there were no space left in the hall. That's why I could not see your performance. Why do you think listeners are attracted so much by the sound of the East in jazz? I.M: I think that Western musician has always been interested in egzotic colors. Salsa at some point had a period. Everybody was on salsa. Everybody was on African music at some period also and mixing with jazz. F.E:...and this is your time? I.M: I think now especially with the problem that is happening between the Western world and the orient there is a clash. I think that people are starting to understand that maybe music and art in general might be a solution to avoid this clash. The conflicts that are happening always as West against East. It's not anymore South against North. F.E: Maybe we have no hope rather than music. F.E: Progressing in time. It's being affected. F.E: Creating itself like an organism. I.M: Exactly! It is still alive. It is not like some old music that are like in boxes and in the libraries. You know there are some music you open like an old book like baroque music. It is like a very old book that you take its dust off you know, you open and listen to the music. Jazz is not like this. There is pre-history, there is history, there is pre-present and future. Now we are building the present. I am very happy and proud of being here now and being participating to this. We are so many there. The guys you just said but there are many many others that we don't know - people that we don't hear about, that are great musicians. Everyday I discover great guys in music that are mixing all those things. I.M: In Turkey there are so many guys, so many guys... It is really impressive. F.E: Fortunately I could listen to you with E.S.T. Symphony project in the same festival with the piece Behind The Yashmak. We, as Esbjörn Svensson Trio fans, were really impressed by what you did in the solo. I.M: They gave me some space - not so much but they gave me some space and I used it. F.E: Was it just on-the-fly? F.E: How did you feel about playing with Magnus and Dan in an E.S.T. composition? I.M: Oh, Kurt Rosenwinkel. Oh my God. He is a genius. F.E: His own concert was also fantastic. I.M: He is a genius guy. I was really proud to be a part of this huge project. F.E: It was an amazing performance. Behind The Yashmak solo is getting viral among E.S.T. fans. Do you listen to jazz made in Northern countries in general? I.M: I have listened. Not anymore so much, because I don't have so much time. I work so much on music. It is not easy to get this point but when you compose a lot (this is difficult)... I compose a lot for cinema, for singers, I compose a lot for me, for my albums, for other projects and I work so much. F.E: Yeah, there is the last soundtrack album. How was it like working for the last soundtrack album for Yves Saint Laurant? I.M: It was great because the movie was very beautiful - really the image was really really great. I had to find the music that is very delicate and fragile because Yves Saint Laurant is very fragile and very delicate - you know. I had to find something like this and also something that had to be powerful because he was a big name and very powerful. The interesting point - I mean my point - was to find a combination of these things and be myself but also not completely myself because it was for the movie. It's not only about me. F.E: There were trade-offs maybe? F.E: Although your sound is always carrying an oriental flavour, considering some names you have given to your pieces in the album, I felt like your music is very well related also with your current experiences and what you have been living at the moment. We see some modern connotations. Can we say that you are merging the inspiration coming from your hometown with what you have been currently facing? I.M: I think that my music is the reflection of what I am and what I am is... I am Lebanese and I come from Arab culture but I have been raised in Western Europe. I remember and I know very much where I come from and it is very important for me where I come from. My culture is very important for me but as much important for me is who I am living with and the society I am trying to live in. So my music is the same - you know. As much close to my origins and my culture but also very much including the life of today. F.E: Now I'd like to come to one of your masterpieces: Beirut. I hear a deep melancholy and sad memories behind this composition. It should be about the problematic and harsh conditions of the city. Can we say that an artist with difficult experiences, sad memories and a troubled life are closer to the light of creativity compared to the others? I.M: I don't know but for sure in my case, the fact of growing up with a fear of death and destruction makes me love life so much. This is probably the center of everything I do, because I love to be alive so much and love the world so much even with all the problems existing and we know how many they are - all the troubles that are happening all around the world. I love being alive. F.E: You know the value of living now. I.M: I think so -yes- and music for me is the expression of being happy of being alive. I really fear death. I am really scared of this. Everything I do is made to remind me that I am alive. F.E: Maybe you are running away from death. I.M: Yes, running away from this and trying to go as far as possible and this is a some kind of light. F.E: We all know that your father is the inventor of quarter tones in the trumpet. In the documentary Souffle you say that the quarter tone trumpet is something that enables you to talk musically both in Arabic and French. I.M: Not Arabic and French but let's say Arabic culture and Western culture. F.E: I am understanding from these words that you can play Arab maqams with the quarter tone trumpet. If your father had not invented the quarter tone trumpet would you be still playing the trumpet? I.M: I wouldn't be a musician. He is the one who made me love music. I would probably enjoy listening to music. F.E: Did he push you to play? I.M: He did not push me to play but he was really a very strong teacher and he made it as if it was the most important thing in life. F.E: It is a very strong lesson. I.M: Music made him escape his misery. He is still alive but he had a crazy life. F.E: Maybe he was trying to take words from Nietzsche "Without music, life would be a mistake." I.M: Maybe but for sure, music and especially trumpet made him escape misery and it completely changed his life. He was somebody else and thanks to trumpet and thanks to music he became somebody else. I am not talking about being famous, I am talking about what is in your mind and who your are inside. F.E: You will be surprised but same applies to me. I am not playing music and I was just an electronics engineer when I started to listen to jazz almost 10 years ago. My life has changed totally from bottom to top. I.M: So you understand what it means. F.E: Yes. I started to travel for music, I started to meet people, I started to be a person full-of-life - a better person. F.E: Yes. I started to try to merge West and East like you. I.M: But you live here -especially in Turkey- right in the middle geographically trying to make compromises. That's why I think and believe that Turkey is one of the most interesting countries. Actually my uncle Amin Maalouf wrote a lot about the culture here. I grew up reading his books. I have always felt that in this part of the world there is a compromise between tradition. Usually in Turkey, not everybody but in general in history -even until now- people have always tried to mix their culture wih modern world - the modern Western world. We have always been touring between those two things. People here had to really find a balance between those things. It is not very easy. You are right between Europe and Arab world. You are not Arab, you are not European, you are just something else right in the middle. You have to find your way. I am very interested in this. F.E: That's our chance and your chance may be getting raised in such an intellectual family. I.M: I don't know. Maybe. Maybe. F.E: How does it feel like working with Sting? I.M: He is a very very nice and careful person. I.M: In Italy because I worked with him two weeks in his Toscana house. It was very interesting because he is a very nice and humble person. F.E: Maybe that's why he always say "in my humble opinion". F.E: Yes you can see it on DVDs. Was the house the one that was on one of his DVDs? I.M: Exactly. This specific house. Very huge. F.E: Did you play in this performance? F.E: It should be right after 9/11. It is an impressive performance - he first express his sadness then starts to play. F.E: I am sure you have listened to Miles Davis a lot. You are an innovative trumpet player like Miles and inserting the trumpet into the different styles like what Miles did in 70's. How do you define and compare what Miles Davis was doing and what you are currently playing? I.M: I can not compare because for me Miles is the man who changed completely the face of trumpet in jazz. He really made it - go towards a direction that nobody had before. But I don't consider myself as going so far yet - maybe one day. Of course I admire a lot Miles and everything he achieved but I am much more impressed by what my father did. Because Miles grew up in United States and lived all his life in United States - the country of jazz. F.E: He was born with jazz. I.M: He was born with jazz. He heard jazz when he was seven or eight years old. He started to play trumpet when he was nine. His parents were rich. His father was a dentist. His mother played organ in the church. I.M: Yeah, exactly and they were wealthy. He studied classical music and then he started jazz because he think it is cool. I.M: He had all the options. He played with Bird... You know his life. There is something very logical in his life. He followed this, he went very far and it's great. But when I think of my father's life, I am much more impressed because he grew up in a farmer family in Lebanon in 40's. I.M: No music except maybe the Arabic traditional music and he discovered trumpet for the first time when he was 23. He had no money and no future. He just took a boat and escaped whether his parents were telling him not to do it. They were telling him "don't go, you're gonna lose yourself, you're gonna be crazy, you don't speak French, you haven't gone to school, you don't know how to write and read Arabic, you don't have money, you just discovered the trumpet and you wanna go to Paris conservatory. Who do you think you are?" And he left and from there he studied classical music and he became one of the top trumpet players of classical music in France. F.E: He should have felt like Man on The Moon. I.M: Yeah. He is really that kind of man. I so much admired his life. He made something that very few people in the world did. You know when you don't have the choice... He invented this trumpet. F.E: He built his own way. There was no way and he built his own way. I.M: He made it. There was no way to go through and he opened all the doors. I so much admire him. For me he is the example. I work so much today and I know that if I work so much, if I can't sleep during the nights and I am always thinking of "I have to work, I have to work, I have to work..." because my father did all these and I can't fail. F.E: Well what do you think in general when you compare the jazz music made in its hometown United States and jazz made generally in Europe nowadays? F.E: They are concentrated on how to play instead of what to play. Can we say that? I.M: Yeah, exactly. Exactly. Maybe Europan musicians and maybe the rest of the world in jazz is more interested in mixing American culture to something else. F.E: They are trying to find melodies in the compositions. I.M: They are trying to find a melody that is different. Trying to find harmony that integrates other things... Trying to find a Jazz with different rhythms... You know this kind of mixing, which is very interesting for jazz also. You know it spreads all over the world. It's like a telephone you know. It may be made in silicon valley but you have all the languages - you can have it in Chinese, in French... It works also. That's why I love jazz. It travelled all around the world. Each country integrated jazz and made its own way. F.E: What about Turkish jazz musicians? Do you know any? Did you work with any of them before? I.M: When I was young I used to listen a lot to Laço Tayfa for example. I.M: Yeah, Hüsnü for me... I know he is like a star, he really created something. I really believe he is one of the best guys. I really love also the new generation of guys like New York Gypsy All Star who are based in New York. They are great. I.M: Who knows. We don't know. For sure the concerts will exist because if there is no concert, there will be no music. F.E: But you are not sure about the album sales and records? I.M: I think we can't avoid albums and if there is no album nobody tours. F.E: Yes I agree. I am still buying albums don't worry. I.M: Me too. I think we should reconsider people's education about this. People don't understand why it is important to buy the album. They think "Hey, the album here is -I don't know how much- but I can get it for free. Why would I buy it? I would be stupid to buy it." Yeah you would be stupid -maybe- in this world but there is another world. Somebody paid to make this album and if you like it and you don't pay to get it, this person will not get enough money to do another one. F.E: That's a general thing in fact - not only about music. I.M: It's right for everything, yeah. F.E: Imagine that every father tells the same thing that your father told to you "music is the most important thing in the world." I.M: Yeah, if you love arts - whatever could be the kind of art - you can not be unaffected. There is a simple question I usually ask to some people. Would you imagine a world without arts? They say no. I.M: Yeah but love is a kind of art, living together is an art, eating is an art. The couch we sitting on... Somebody designed this. Somebody designed this (showing the sofa next to us). So if there is no art, there are no walls, there are no couches, there are no carpets. F.E: But people are missing all of these while living in busy life. I.M: They think that it is obvious. They take it for granted. F.E: They think they are trivial, straight forward. F.E: They have been educated for this. I.M: Yeah, they have been educated for this. Can you live without music? I doubt. I doubt anybody could live without music. F.E: What is the next step in your career and what are future plans? I.M: I have lots of projects. Many many many things... I really hope that I don't know them all. I really hope that something that I don't expect are gonna happen. Because all my plans are so already here. I am preparing for example two albums as tribute to Umm Kulthum. It is already ready - we're gonna release this in a year. F.E: Really? With the same band in Illusion? I.M: No. One of the bands will be the same with the previous album Wind - acoustic jazz quintet- and we're gonna play one of the most famous Umm Kulthum hits. The other one is also a tribute to Umm Kulthum but in a different way. It's my compositions. It will be a quartet. Two members of the band I am playing with now will be two of the three guys who play with me. And the third one is the piano player Éric Legnini. F.E: Thanks a lot. That was an amazing interview. Thanks for your time. I.M: Thanks man. It's my pleasure.